The purpose of this paper is to analyse the feasibility of investing in a new milk powder factory, based on a case study of leading domestic producers in China and Netherlands. A key issue is the cost of the project, but a high cost does not mean it is not economically feasible, nor does a low cost guarantee the investment. Instead, systematic indicators should be used to associate the cost with profitability, returns to assets and corporate strategy. Limitations: It is worth noting that the case study here is based on the latest financial reports of the companies, so the conclusions might be subject to the special conditions of the particular company in the particular year. Therefore, wherever possible, all recent financial reports available are used to provide robustness check. Another limitation of this case study is that there is no way to extract more detailed cost information other than that disclosed in the published financial reports. To obtain an absolute estimate for the costs of building the factory, private information should be exploited elsewhere. In December 2013, Chinese government announced a new regulation on formula milk powder production, which has imposed more restrictions on “combined process” and “wet-mix process”. This policy change leads to an inevitable need for upgrading the production technology in the near future . Moreover, total global milk production in 2013 was lower than in 2012 due to the drought in New Zealand (14% lower), the mediocre quality of the available roughage in EU (2% lower), and bad weather conditions in Australia (8% lower) and Argentina (7% lower). As a result of this supply side shock, sales prices remained high during the second half of 2013. On the demand side, particularly the demand for milk powder in the world market remained exceptionally high due to the high demand from China and Russia. During the second half of 2013 China imported 25% more dairy products (mainly milk powders and infant nutrition) than during the comparable period in 2012. This meant total imports of around 4.5 billion kilos of milk equivalents. In the same period Russia imported around 173,000 tons of cheese and 52,000 tons of butter—10% more than in 2012. The new food safety legislation in China was also embedded in the internal quality programmes, exacerbating the gap between supply of and demand for high quality milk powder products. As a leading Dutch dairy producer, FrieslandCampina (It has a premium brand in infant milk powder, Friso, gaining fast popularity in China after a confusion regarding the origin of various brands in 2013) has a mature supply chain of milk powder products and other dairy products in the whole world including China. It makes FrieslandCampina a good international counterpart of the decision maker’s company. Note that both chosen cases, YILI and FrieslandCampina , are well-established milk powder producers, which are comparable to the decision-maker’s company. Therefore, the fluctuations in both profitability and returns are not subject to transition effects such as initial increasing return to scales/scopes. The decisions of whether expanding the investment or keeping status quo are mainly driven by the market factors and their expectations of these factors. The following sections are applying the two indicators to explain the investment activities of FrieslandCampina in the recent five years, so as to inform the decision making on whether an expansion in milk powder production is financially favourable . To analyse the financial feasibility of the investment project (i.e., building a new milk powder factory), cost is obviously the most important information for decision making. However, the profit and assets will also be affected by the investment, so a comprehensive financial analysis should take into account the implications of the cost as well as the cost per se. In addition, the strategic considerations also play a vital role-even if the investment seems financially infeasible in the short run, it may be strategically justifiable to compete with the competitors in the long run (Table 1). Table 1. Profitability and return indicators of the dutch producer (in million euro). Notes: The investments here are the addition to the assets, i.e., the formed capital stocks, which are different from (less than) the investment which also includes construction in process. The following sections make use of the published financial reports of a leading domestic milk powder manufacturers to imply the cost effectiveness of the investment. The effectiveness is measured by two systematic indicators. First, compare the profit margin of the investment on the new factory with the average profit margin of the other products in the same company (to compare like-with-like). If it has a relatively higher profit margin, then the investment is cost effective; otherwise, it is not suggested to proceed with establishing a new factory (The first indicator is in line with the law of NPV) . Second, compare the returns (e.g. ROA, ROE) of the investment on the new factory with the average returns of the other products in the same company. If it has a relatively higher return, then the company should consider increasing the investment; otherwise, it should keep the level unchanged (not suggest to disinvest considering the adjustment costs) (the second indicator is in line with the law of diminishing marginal product of capital). Note that the first indicator is particularly informative to outsiders—whether a company without such a factory should build one, while the second indicator is informative to insiders—whether and how a company with such a factory should increase its investment. YILI is one of the leading domestic producers of milk powder adopting wet-mix process method. In 2012, its total revenue on milk powder products is ¥4.484 billion and the profit margin is 39.49%. According to the first indicator (the blue bars in Figure 1), we can see a strong support for establishing the new factory given the outstanding financial performance of the new production technology. 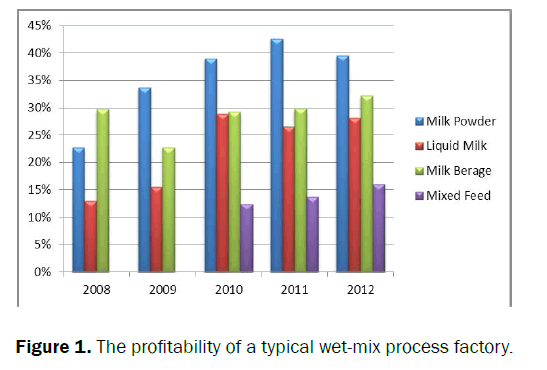 Figure 1: The profitability of a typical wet-mix process factory. The detailed profit margin figures can be found in Table 2 of Appendix I. As shown in the graph and table, when the discrepancy in profit margin between different product lines emerged in 2009, YILI started to increase the investment in milk powder factory (through investment in DuErBoTe discussed below). Later on, the profit margin begins to fall and the profitability is more balanced across all projects within YILI, so it does not have further incentve to increase the investment. However, there is still a huge capacity of investing in the milk powder production for an outsider company which intends to build a new factory. Judging from the YILI case, milk powder seems to be able to generate the highest profit compared to the other dairy product lines. Table 2. Profitability indicators of the chinese producers (Yuan). As shown in Figure 2, the milk powder products made a loss in the year of 2009 (-1.33%), lower than the overall business (2.22%). Given this underperformance, the asset share (the green line) was kept low during 2009. From 2010 onwards, the milk powder has an exceptional outperformance compared to the other products, resulting in a growing asset share via dedicated investments. As the gap between milk powder and other products shrinks (e.g. 2012), the asset share (and the investment) of milk powder also drops a little bit. This significant positive correlation between profitability and investment is obviously followed by FrieslandCampina. This is another example (in addition to YILI case) showing when an expansion investment on milk powder should be taken. The decision maker is suggested to check the overall profit margin and compare it with that of the milk powder products. The detailed profit margin figures can be found in Table 2 of Appendix. 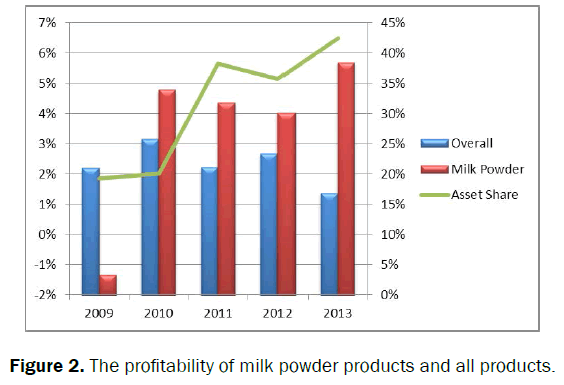 Figure 2: The profitability of milk powder products and all products. According to the second indicator, the return on assets (ROA) can be used to inform the decision maker whether the investments on milk powder factory should be increased, and the return on equity (ROE) can be used to inform whether the investment should take the form of paid-in capital (equity) or debt (liability). DuErBoTe is the largest subsidiary company specialising in milk powder production for YILI. Its total assets are ¥601,303,100 in 2012, with an annual production capacity of 45,000 tons. The ROA and ROE of DuErBoTe are contrasted with the overall averages of YILI. Obviously, they are a bit lower than the average performance in the recent years. It implies that YILI should stop increasing the investment on milk powder production in 2011 (when the ROA of YILI overtakes that of DuErBoTe), which is consistent with the conclusion in the previous section’s conclusion . The increasing investment in milk powder factories in 2008 and 2009 by YILI is also justified by Figure 3 (Nevertheless, the low returns may be also partly due to the decline in sales of the milk powder products). The detailed ROA can be found in Table 3 of Appendix I. Figure 3: Difference in ROA between YILI and DuErBoTe. Table 3. Return indicators of the chinese producers (Yuan). According to Figure 4, the low ROE of the milk powder project indicates that YILI should keep the existing paid-in capital or increasing the asset through debt rather than equity. This is verified in YILI’s annual financial reports that its paid-in capital for DuErBoTe did not change over the last several years. The detailed ROE can also be found in Table 3 of Appendix I. 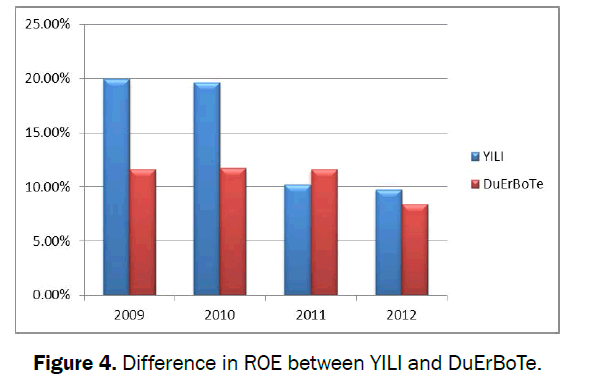 Figure 4: Difference in ROE between YILI and DuErBoTe. The implication to the current project is that the company in stake needs to check its own ROA and ROE in contrast with those of milk powder industry (DuErBoTe could be used as a proxy). If its overall ROA is relatively lower than that of milk powder industry, then a further investment is supported. In addition, ROE informs the capital structure of the project (Figures 5 and 6). 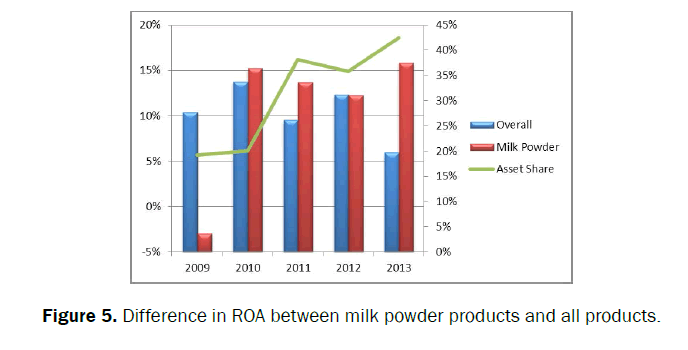 Figure 5: Difference in ROA between milk powder products and all products. 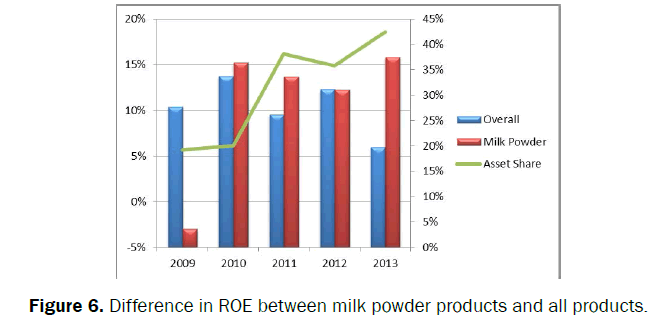 Figure 6: Difference in ROE between milk powder products and all products. Figures 3 and 4 show the relationships between investment and these two indicators. Again, the expansion of capital in milk powder manufacturing is positively correlated with the two return indicators. As the ROA/ROE of milk powder products are higher than those of the remaining products, investments are concentrated in milk powder production . In particular, FrieslandCampina invested 559 million euro, aiming at the growing and the anticipated growing dairy products in 2013. Among others, infant nutrition (milk powder and ingredient) is the largest investment totalling 222 million euro (39.71% of all) (Table 4). Table 4. The annual financial report lists of investment projects on infant nutrition products in 2013. In addition to these investment projects in process, FrieslandCampina also approved of another two major projects starting in 2014, totaling 176 million euro shown below (Table 5). Table 5. Major projects, totaling 176 million euro. These investment expansions are mainly due to the prevailing and anticipated high demand growth in global milk powder market, especially in China (as described in the 2013 annual report, p31, p32, p38, p39, p42, p53, p66). Apart from the two financial indicators, one should also take into account the long run strategic arrangement in the dairy market. Milk powder products in China are still in transition and the main players in this market are trying their best to seize market share. For example, MENGNIU did not invest much in milk formula business until it announced the largest acquisition (HK$11.4 billion) in China’s milk powder industry in 2013. This event makes YASHILI a subsidiary company (holding about 89.82% share) of MENGNIU and enables MENGNIU to capture swift growth opportunities in the domestic pediatric milk formula market . In the international realm, milk powder market is now more like a monopolistic competition according to the HHI (Herfindahl- Hirschman Index, is a measure of the size of firms in relation to the industry and an indicator of the degree of competition among them. Usually, a HHI index below 100 indicates a highly competitive market, 100-1500 indicates an unconcentrated market, 1500-2500 indicates amoderate concentration, and 2500+ indicates high concentration) in the US (924.3). There are many domestic producers rising and falling over the last decade, while international brands still dominate the premium demand . More and more international dairy brands are expanding their investment towards China to seize the market share. A first mover advantage is already realised by some incumbent brands such as Mead Johnson. Once the market is split by these mature international brands (most likely within the next five years), it will be very difficult for any new brand to squeeze in or for any incumbent brand to increase its market share. Therefore, a pre-emption strategy of increasing production capacity and magnifying marketing campaign is suggested. The policy change in the background section also entails upgrading the technology in milk powder production. There is a time lag in establishing the new factory (usually one to two years), and the ones start early will take the first mover’s advantage in milk powder market. This project analysis needs forward looking beyond financial analysis . Cost decomposition of YILI’s milk powder product lines shows that material is the dominating component of the costs. Once the factory is built, the additional costs for maintaining the machine and facilities are less than 5% of the total costs. The structure seems to be quite stable over years (Table 6). Table 6. Cost decomposition of YILI’s milk powder. Although this report is based on a case study of a typical dairy company, the two financial indicators can be used to inform the decision making on investing in a new milk powder factory. In particular, the high profit margin suggests a high capacity of milk powder market and supports such an investment. However, the decision maker needs to compare its overall returns with the project returns to draw a conclusion on whether and how to increase the investment on new factory. Moreover, if original financial reports of the subsidiary companies are not available, there is no way to track down the detailed costs of building the factory, such as the costs of blending, canning line and spry tower. The cost of land is usually negotiated with the local government (sometimes it could be free). These bring about uncertainty in costs, and hence in the profitability and in returns. Appropriate project management and human resources need to be arranged to implement the project. Despite the uncertainty, building new factories for technology in milk powder new production is the inevitable trend in the near future. Given the evidence from the leading domestic and international producers, the decision maker is strongly suggested to check and compare the financial indicators for the milk powder products with the overall averages. Moreover, the timing of investment and capital formation require the decision maker to look forward—it is the anticipated demand and price that determine the future profit margins and returns. As a bird’s view of the whole decision making on the project, there are three other pieces of information should be collected in addition to the two case studies here. Firstly, at the corporate level, the detailed financial reports of the decision maker’s company should be used to calculate and compare the financial indicators between projects, in order to inform the decision. Secondly, at the market level, forecasts on the future demand and supply should be conducted to estimate future profitability and returns of both milk powder products and other alternatives. Last but not least, policy analysis and strategic considerations should also be systematically discussed to fit the project decision to the long run corporate plan. European Commission. On the hygiene of foodstuffs. 2004;852. FrieslandCampina. Annual Financial Report. 2009-2015. IFCN Network. Overview on milk prices and production costs world wide. 2013. Mengni. Annual Financial Report. 2010-2015. National food safety standard. Good Manufacturing practice for milk products. 2013. Recommended international code of practice general principles of food hygiene. CAC/RCP 1-1969. 2003. Code of hygienic practice for milk and milk products. CAC/RCP 57. 2004. Yashili. Annual Financial Report. 2010-2015. Yili. Annual Financial Report. 2010-2015.